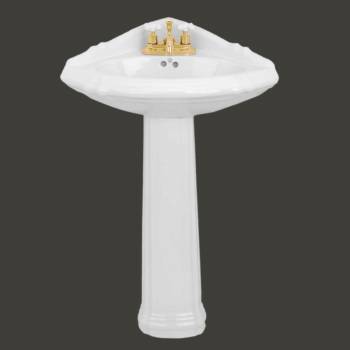 The Portsmouth white pedestal sink from Renovator's Supply features durable ceramic construction and a tasteful traditional design. 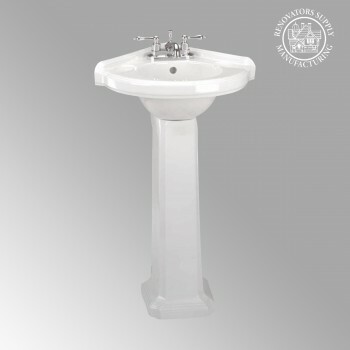 Features: - The Portsmouth is a beautiful reproduction pedestal basin sink. 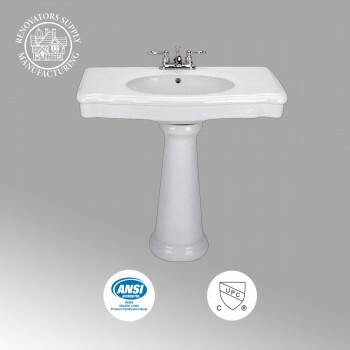 - Open-back white pedestal sinks save space in your bathroom and make installation a breeze. 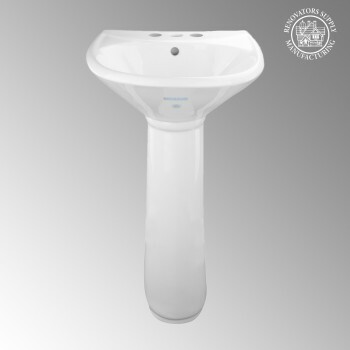 - Constructed from gorgeous Grade A vitreous china porcelain for durability and easy cleanup. - RENO-GLOSS finish protects from scratches and stains. - Overflow hole, self-draining soap dishes and backsplash keep water under control. - Authentic Renovator’s Supply logo guarantees better quality than the knockoffs. Hardware: - Accepts an 4” centerset faucet (not included). - 1-5/8"" drain hole (not included). 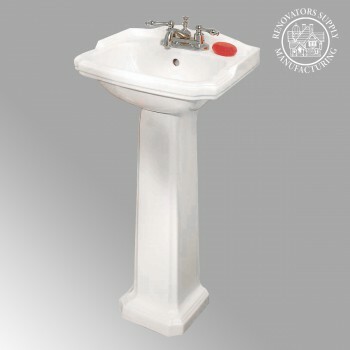 The pedestal is decorative and squared at the top where it rest under the sink basin. Caulking can be applied. This allows for easy removal in case access to the p trap/s trap is needed. Other Details: - Installation Style: Wall Mounted - Design Inspirations: Luxurious old world bathrooms. 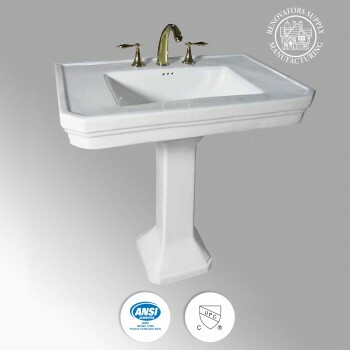 What's Included: - One (1) Portsmouth Porcelain white Pedestal Sink and bracket. The pedestal is decorative and squared at the top where it rest under the sink basin. 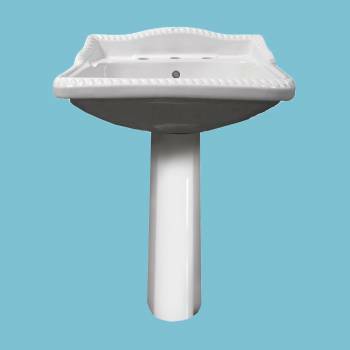 We specifically designed the pedestal this way so that if a ring or other object were to fall down the drain the pedestal can easily be removed. If desired Caulking can be applied to the gap as well. Pick out your Corner Sink here today. Item ID 19358. Pedestal Sink with Roped White Grade A Vitreous China Bathroom feature a contoured backsplash and distinctive roped styling. 34 3/4 in. H, 23 1/4 in. W, projects 17 1/4 in. Accepts 8 inch widespread faucet (not included).